High-class Condenser Microphone for singing anywhere, anytime. Perfectly compatible with smart phone,ipad,computer,laptop etc. Don't have to download special drivers or tools. No need to plug in the power supply,This is a great quality plug and play mic that connects directly to your phone or computer. Ideal for recording singing and musical performances in addition to spoken applications such as podcasting and voice-over. Comes with a triangular microphone stand, feel free to adjust the microphone stand to make the microphone towards any angle,no dead ends to collect your sound. 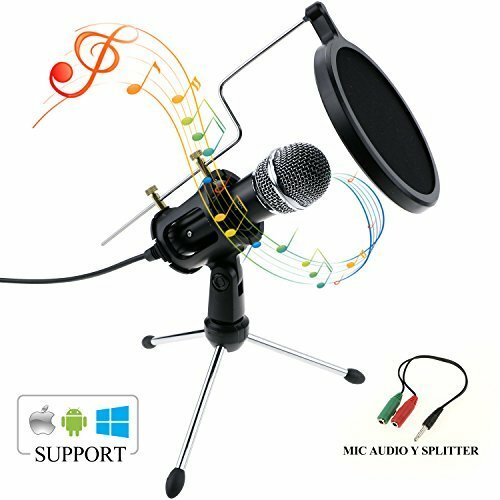 ♫ WIDE COMPATIBILITY - 3.5mm Aux Jack Condenser Microphone Allows you to use your mic with cell phone,iphone,laptop or desktop system / Windows or Mac computer. The 1.8-meter cable allows you have enough length to connected your computer.3.5mm jack, No need external power, just plug-and-play driverless set-up and performance. ♫ FOLDABLE TRIPOD - Ultra-compact and brand new design for maximum portability, you can fix the microphone on the desk with the mini flexible head which is 270 degree rotatable.Convenient mute control while recording. Ideal for both desktop and portable work places. ♫ DUAL-LAYER FILTER - Tabletop microphone mount comes with professional dual-layer acoustic filter to prevent from popping and improve vocal recording quality; adjustable distance between the mic and the filter. ♫ PLUG & PLAY - No Need Addtional driver. If your laptop's microphone plug and headphone plug are the same one(One single 3.5mm jack), you need to plug a Y splitter cable adapter which included in the package to collect and monitor your voice.Same usage on cellphone. Ideal for Broadcasting, Podcasting, Interviews, Voice Recording, Video Conference, Singing over Internet. Online Chatting such as Facebook, MSN, Skype, Youtube and more.